LONDON — Watford manager Walter Mazzarri said Tuesday it was not his decision to allow striker Odion Ighalo to leave the Premier League club for Chinese Super League team Changchun Yatai. Despite having signed forwards M'Baye Niang and Mauro Zarate from AC Milan and Fiorentina earlier in the transfer window, Mazzarri appeared disappointed to have lost the Nigerian striker. 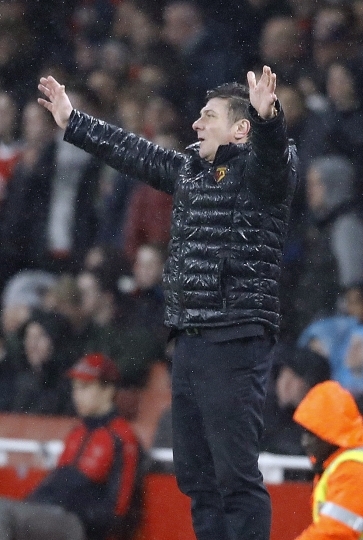 Speaking after Watford's 2-1 victory over Arsenal, Mazzarri said: "I give indications to the club on my thoughts, but then it's up to the club to decide. I never make a player leave my club, especially a player that is a great person and great professional like Ighalo. "Sometimes there are offers and it's the club that decides. I have to do the best I can with the players that the club provides me." Having helped Watford to promotion from the Championship to the Premier League after joining the club in the summer of 2014, Ighalo excelled in his first season in England's top flight, scoring 15 goals. Ighalo had struggled to reproduce such form this season, managing just one league goal and had began finding himself regularly left out of Mazzarri's starting lineup.